Paul Stirling described Ireland's one-day series triumph over Afghanistan as "a fantastic achievement" after the Irish secured a 2-1 comeback success. Opening batsman Stirling was named man of the series after his 101 helped secured Sunday's five-wicket victory over the Afghans in Sharjah. 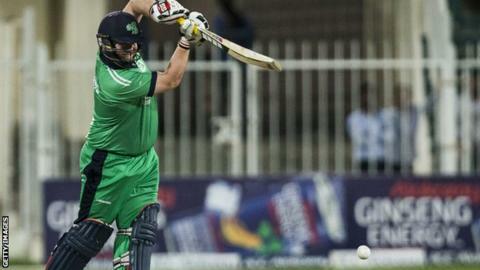 It was a superb Irish effort after they had been hammered by 138 runs in last Tuesday's opener. "We went back and did our homework after the first game," said Stirling. In that game, 16-year-old spinner Mujeeb Zadran took four wickets as the Irish were dismissed for 100 but the Irish regrouped to win by 51 runs two days later - helped by 81 runs from Stirling - before Sunday's dominant win. "We showed great character to win the next two games," added Stirling, whose off-spin is also a regular feature of Ireland's bowling attack. George Dockrell's four wickets and three dismissals from in-form Barry McCarthy contributed to the Afghans being dismissed for 177 on Sunday before Ireland's successful run chase with 12 overs to spare. "The bowlers all did their jobs (on Sunday) and we backed it up in the field," added Stirling, who picked up over £3,700 after being named man of the series. "It was a serious effort in testing conditions. We would have taken 178 to chase all day long." Stirling clubbed 11 fours and four sixes as he notched his sixth one-day international century as he earned the man-of-the-series award for the second successive series against the Afghans. "I've a good record against Afghanistan and that gives you confidence. "I didn't dwell too long in the 90s so didn't have time to get nervous as the 100 approached. I was in a positive frame of mind and if the ball was there to be hit, I did." The series win saw coach John Bracewell's Ireland reign end on a high note after the team's struggles since his appointment following the successful 2015 World Cup campaign. Former South Africa and Sri Lanka coach Graham Ford is taking over the Irish job on a three-year deal and the team's first big test under his leadership will be the World Cup qualifiers in Zimbabwe in March. Prior to that, Ireland are likely to play further warm-up match in the UAE in January. Two months after the World Cup qualifiers, Ireland will make their Test debut when they face Pakistan in Malahide.